In 2018, smartphone photography and video capturing is on all-time high. People are doing photography and video recording from their iPhone as a hobby and to share it on social-video sharing websites such as Vimeo or YouTube. 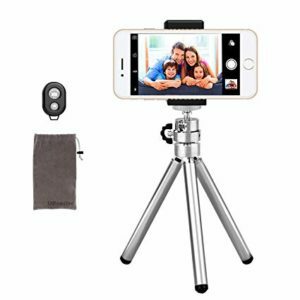 In this blog, few of the best iPhone Tripod 2018 has been elaborately discussed with their pros and cons. Hope, in depth review of iPhone Tripod mound will help you to choose the best one for yourself. In the latest iPhone XS and iPhone XS Max, Apple has incorporated so many features like self-portrait, low light, time-lapse, slow-motion etc. And if you use a perfect Tripod then the quality can get really enhanced. A portable, affordable and easy to use Tripod will help you to get the perfect shots that you have in your vision. In the list of my iPhone Tripod pick, some of the brands may not be that popular but the stand toe-to-toe in performance and functionality. Being the consumer, your benefit is that you get a great product at a very reasonable rate. All the iPhone Tripod in this list are good in mounting and grip. Each one of these will hold your iPhone or any smartphone of similar dimension very easily. Joby GorillaPod Hybrid: This first Tripod in our list is very versatile and handy. It weight around 190.5 gm. and its dimension 2.17 x 2.17 x 10.12″ (55.118 x 55.118 x 257 mm). This Joby Gorilla Pod is made up of Japanese medical grade plastic to German TPE Rubber. They are highly durable and perform very well for a very long time. This comes with one year guarantee. The GorillaPod has so many versions such as Joby GorillasPod 1k kits and Joby GorillasPod Hybrid. On both the Tripod, the manual adjustment is easy and simple. 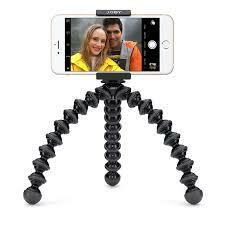 With Joby GorillaPod Hybrid as a Tripod for iPhone, you get perfect grip on one arm length. It is equally good for selfie as well as vlogging. From price point-view, Joby GorillaPod Hybrid is a bit expensive but in return, you get high grade built, flexibility and versatility. Joby GripTight Micro Stand: This is another Tripod from Joby for iPhones. It is extremely and compact and could easily come in your trousers pocket. It works very well on flat surfaces and is very stable. On the other hand, it has rubber feet that allow stability on rough surface like rock. It contains adjustable mount hence it size can be adjusted based on your iPhone model. For control over angle and position of the smartphone, it contains aluminum ball head. 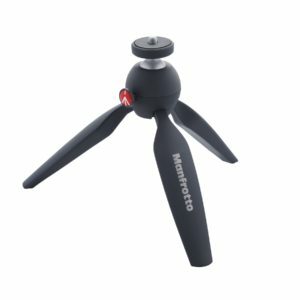 Manfrotto Mini Tripod: Manfrotto is a very renowned name for making high quality products related to photography. This new Tripod from Manfrotto could be every iPhone photographer’s desire due to its compact size, It doesn’t have adjustable grip mount for iPhone but Manfrotto offers a separate iPhone case for 25$ that works as an adapter that slides on the tripod. Alternatively, you can purchase other iPhone Tripod mount separately that will get attached on the screw threat of the Tripod. It contains a ball adapter for mounting plate to be angled. The push button is present on the side of the ball that is used to angle the mounting plate. It has overall excellent grip over the smartphone. You will notice the least camera shake while handheld videography. For iPhone users, Manfrotto offers some special products that are compatible with Manfrotto Mini Tripod. Some of them are Manfrotto KLYP+ Case, Lenses (wide angle and telephoto Macro), Light etc. Kobra Tech Flexible: This is the best alternative to Joby GorillaPod if you don’t want to spent hefty amount. This Tripod is flexible and is very handy. The dimension is 10 x 3 x 3” and its weight around 86.18gm. It contains industrial grade metal ball joint and ¼”screw. The company provides two year warranty which is very decent. With the Kobra Tech Flexible, you get carrying bag, iPhone mount, GoPro mount and a remote that is wireless. The remote could be used with smartphone to control the remote shutter release. It can be used for clicking multiple images from a distance of 30 feet. The iPhone mount could be extended up to 3.75” so all the versions of iPhones easily get fit in. The legs are covered with a rubber material that provides excellent grip and safety when the legs are bent. The legs are not very wide or big but are perfect for average hand rail. It contains plastic screw cover with twisting features that allows users to position the iPhone for portrait as well as landscape. 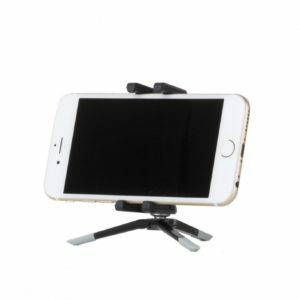 If you are a looking for iPhone Tripod that could be used single handedly and grab stable vlogging and self-portraits shots then is for you. It is easy on pocket and it cost just around 17 bucks. 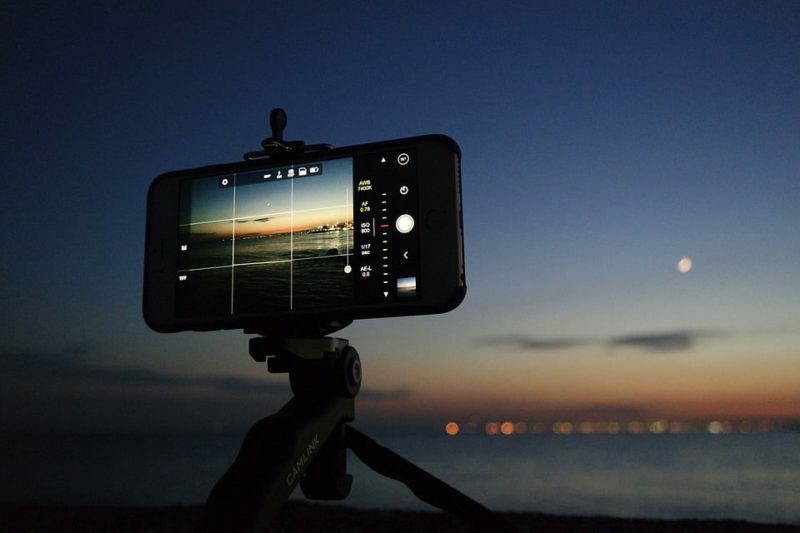 UbeeSize Aluminium Tripod: The next recommendation in this Best iPhone Tripod 2018 list is UbeeSize Aluminium. This is a light-weight Tripod with unique silver color that keeps it apart from most of other black tripods. It allows user to attach the devices with width up to 3.75” so every version of iPhones are compatible with it. It contains ¼” screw that could be used to attack high quality mount. Its aluminum legs could be adjusted and could be extended up the height of 11.6”. The ball head feature to rotate 360 degree and tilt to 90 degree and thus taking beautiful and accurate landscape as well as portrait shots gets easy. For adjustment, its twisted grooved plastic screw grip comes very handy. It is very easy on hold and twist. In UbeeSize Aluminium iPhone Tripod box, you get a Bluetooth remote control. It contains two separate buttons for taking pictures for iPhones and Android smartphone. This UbeeSize Aluminum Tripod comes with the lifetime money back/replacement service which is very unique and is not provided by any other iPhone Tripods. If anything goes wrong then you should definitely claim for the replacement. The other good thing is its price. It cost only $10 which is the cheapest among all the Tripods reviewed here. A little investment on small things like Tripod and Mount will help you get the best sharp shots. 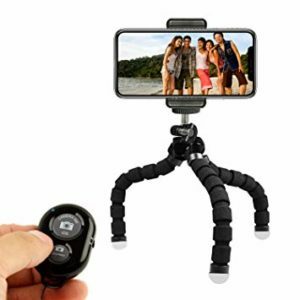 If you have spent hundreds and even more than thousand dollars for the latest iPhone XS Max then you should definitely spend few bucks on some good iPhone Tripod to get great photos. The iPhone has great capability in photography and vlogging opportunities. So, even if you think that you don’t need a tripod for your iPhone, just buy one which is cheap. UbeeSize Aluminium which is around 10 dollars will be best on such case. Joby GorillaPod Hybrid Tripod will be expensive so don’t use it as your first Tripod. A good Tripod mount could never be a burden as they are very handy. Next time when you struggle to get great photos, you can quick take out your Tripod and get the best shot you always tried for. iPhone Tripod will be very helpful all those situation when there is need to steady the iPhone. Blurry photos are primarily caused by camera shake and this could be avoided by using Tripod. It helps a lot during low light situation when there is slow shutter speed in the iPhone. Tripod is equally helpful in long exposure photography, time-lapse photography and to take self-portraits.